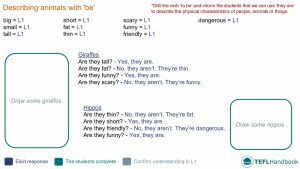 An ESL lesson plan for teaching beginners how to describe animals using the verb to be. This lesson includes a lead-in activity, several group activities, a game and a collection of specially selected ESL resources from around the web. If you're an Android or iOS user, we recommend you try this lesson out on our TEFL Handbook app. It gives you offline access to all of our materials, perfect for quick reference in the classroom. Start by adding the adjectives to the top the board and using gestures to elicit the L1 translation. Next, draw the images of giraffes and hippos and start to add the questions. Finally, try to evoke the correct responses and add them to the board. 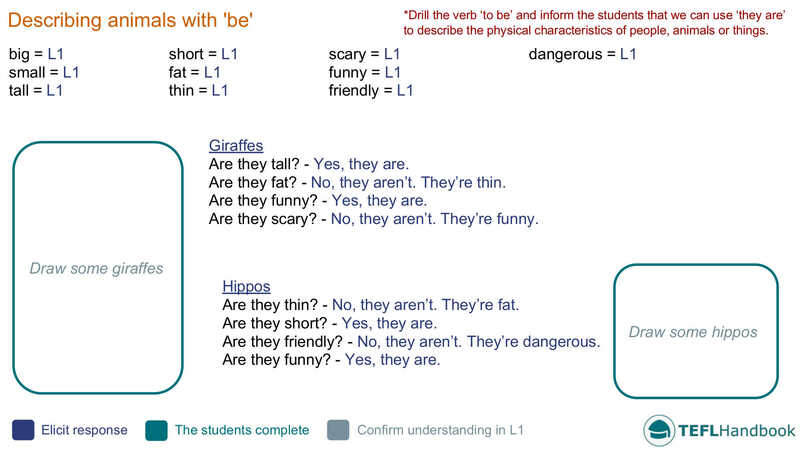 Depending on the age or level of the class, you may need to revise/drill the verb 'be' beforehand. Students use the newly learned language to identify different animals. Which animals are + big/tall/small/…? With the students' help, write about your favourite creature on the board. Use the template below as a guide and elicit as much as possible from the students. If you can, confirm their understanding in the L1. Tigers are dangerous and scary. They aren’t tall or friendly. In this follow-on activity, students will use the previous template to write about their favourite animal. Following on from the previous task, students will now write about their favourite animal. Encourage them to copy the same structure that you used in the last exercise. After you have corrected it, they can read it to the class. A stripped-down version of 20 Questions where the students get to practise the target language. Student A: Are they small? Student A: Are they dogs? Student C: What colour are they? Student A: They are blue and yellow? Student B: Are they parrots? For more advanced classes, switch it up so that the student in play is pretending to be the animal and is responding in the first person singular. If you want to use the topic of animals to develop more vocabulary, there are some fantastic ideas in this lesson plan from the British Council. There's also plenty of inspiration this blog post from BusyTeacher. Although some may require props and a bit of preparation. For a worksheet on the vocabulary learned in this lesson, try 'Describing animals' over at iSLCollective. It does contain a more comprehensive list of adjectives, but just have your students complete it for the adjectives that they know, and encourage them to ask questions about the ones they don't. If your classroom allows you to play videos from the web, check out Mark Kulek's series of videos on animals. They practise expressing likes and dislikes along with common adjectives to describe animals. Below is the first video from that series. If you've found these ideas useful, have a look our complete list of ESL lesson plans for beginners (A1 Mid-level), as well as our entire collection of ESL lesson plans. Our suggested next lesson is about places in the town. Are you an Android or iOS user? Then you should give our app a go! The TEFL Handbook app has over 100 lesson plans, 300+ ESL activities and over 100 ideas for classroom games. All of which can be accessed offline. Perfect for quick reference in the classroom.